This is the seventh movie in the Boston Blackie series. Blackie, wipe that smile off your face. You have an appointment with death. 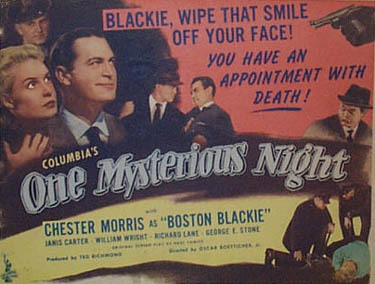 This is one of three Blackie movies that were given non-identifiable titles so that Columbia could coerce non-"Boston Blackie" fans into the theatre. 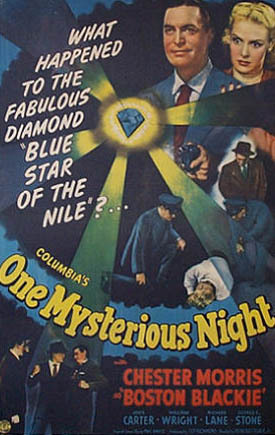 When the Blue Star of the Nile diamond is stolen from a jewel exhibit at the Carleton Plaza Hotel, who do you accuse? Who else! Inspector Farraday publicly accuses reformed jewel thief Boston Blackie of the crime. Blackie and The Runt go to police headquarters to find out why he is accused. Farraday apologizes to Blackie and explains he wants Blackie to help find the diamond. Farraday says if Blackie will locate the gem, he'll drop the charges. This time the cops go too far and issue Blackie a police badge, which Blackie uses with amusing abandon. Of course when trying to recover the diamond there is a murder, George Daley is shot. Dorothy Anderson witnesses George being shot and reports that Blackie did it, so now Farraday is after Blackie on a murder charge. Is the diamond real or a fake, are the mannequins alive or not? One thing for sure, Jumbo Madigan has a bullet in him. When the Blue Star of the Nile diamond is stolen from a jewel exhibit at the Carleton Plaza Hotel, Inspector Farraday publicly accuses reformed jewel thief Boston Blackie of the crime. Blackie, who along with his sidekick The Runt, is now legally employed at his friend Arthur Manleder's tool factory, takes umbrage at the accusation and pays the inspector a visit. At police headquarters, Farraday apologizes to Blackie and explains that he planted the story to entice Blackie to come to his office so that he could deputize him to recover the diamond. Accepting Farraday's assignment, Blackie visits the jewel exhibit disguised as elderly Professor Hunter and discovers a wad of chewing gum stuck underneath a display case. After learning that George Daley, the hotel's general manager, is in charge of the exhibit, Blackie searches Daley's office and finds a pack of chewing gum in his desk drawer. At that moment, Daley's sister Eileen, a switchboard operator at the hotel, enters the office, but is fooled by Blackie's impersonation. 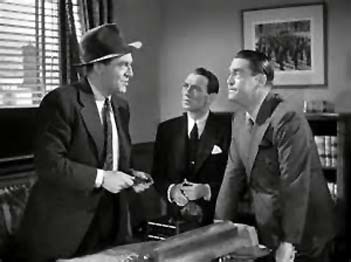 When Blackie goes to the hotel's concession counter to question the clerk, reporter Dorothy Anderson recognizes him and turns him over to the police. 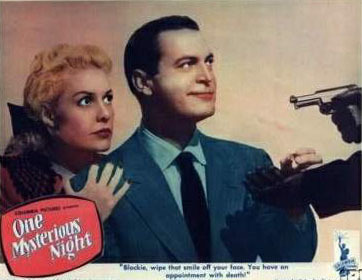 After Blackie instructs Farraday to notify the press that he has escaped from jail, he returns to the hotel, and now posing as Eileen's love-lorn suitor, learns her address. Meanwhile, at Eileen's apartment, George opens her dresser drawer and inspects the diamond, which he has hidden in her purse. Later, an unsuspecting Eileen decides to go out and takes her purse from the drawer. At that moment, Blackie rings the doorbell and accuses George of being involved in the robbery. After Blackie leaves, Eileen follows him, and George realizes that she has taken her purse with the diamond. Soon after, Paul Martens and Matt Healy, George's partners in crime, arrive at the apartment and demand the gem. When George tells them that Eileen has it, they warn him that they will return later that night. Meanwhile, Eileen has followed Blackie to a Chinese restaurant, where he shows her the wad of gum and explains his theory that George stole the stone by hiding it in the gum. Runt then warns Blackie that Dorothy is outside the restaurant, so Blackie tells Eileen to meet him later that night and disappears through a back door. Upon entering the restaurant, Dorothy follows Eileen to the powder room and surreptiously switches purses with her so that she can discover Eileen's name and address. When Eileen returns to her apartment, George grabs her purse and panics when he discovers that she has picked up the wrong bag. Soon after, Dorothy appears at the door to return Eileen's purse. After she leaves, Eileen finds the diamond and insists that George meet Blackie that night and give it back. Later on the street, as George hands the gem to Blackie, Martens and Healy pull up and demand the stone. In the ensuing struggle, George is shot and Martens forces Blackie and Runt into his car and speeds away. Dorothy witnesses the incident and reports that Blackie shot George, and as a result, Blackie is charged with George's murder. To insure that the police continue to believe that Blackie pulled the trigger, Martens takes him and Runt prisoner. To buy some time, Blackie tells Martens that the diamond is a fake and that the real gem is locked in the hotel safe. Martens and Healy decide to have the gem examined by Jumbo Madigan, the owner of a pawn shop, and after their captors leave, Blackie and Runt escape, and Blackie telephones Farraday to direct him to Madigan's shop. Meanwhile, at the shop, Jumbo is examining the stone when the doorbell rings, forcing Martens and Healy to hide in the back. Blackie tricks Martens and Healy into believing that he is a delivery boy and then tells Jumbo to claim that the diamond is fake and stall the thieves until the police arrive. Alerted by the sound of police sirens, Martens and Healy take Jumbo hostage, and when he resists, they shoot him. As the police burst into the shop, the thieves pose as mannequins until the officers leave. Believing that the diamond is a fake, Martens and Healy return to their apartment where Blackie and Runt, pretending to be their prisoners, offer to retrieve the real gem. When Martens insists on holding Runt hostage, Blackie goes to police headquarters and gives the diamond to Farraday, who then orders his assistant, Mathews, to organize a police dragnet around Martens' apartment building while he and Blackie return to the apartment. Upon their return, Martens and Healy tie them up and escape through the back door. After the police break down the apartment door, Blackie captures the thugs, and Farraday apologizes for misjudging his character. Dorothy then snaps their photograph for her newspaper, and Blackie chases her down the street.